K – k – k – krazy korean kulture | Kimchi with Eish! So today marks the two month mark since our first breath of Korean air! It has most certainly been an interesting two months and although the time just flies by, it feels like we’ve been here for ages! Culture shock is real, and if anybody denies it they are only fooling themselves. There are a few things here that irritate the living daylight out of me and although I don’t think i’ll ever get used to it, i’ll just live with it. But then there are other things that amazes me and automatically makes me smile! There are a few cultural nuances here that I just thought I had to share it! So here goes! Many Koreans will wear these masks on a daily basis. Now from what I could gather most of them wear it during yellow dust season. Yellow dust is airborne bacterial crap that blows over from China. It’s disgusting and cause you to fall ill. 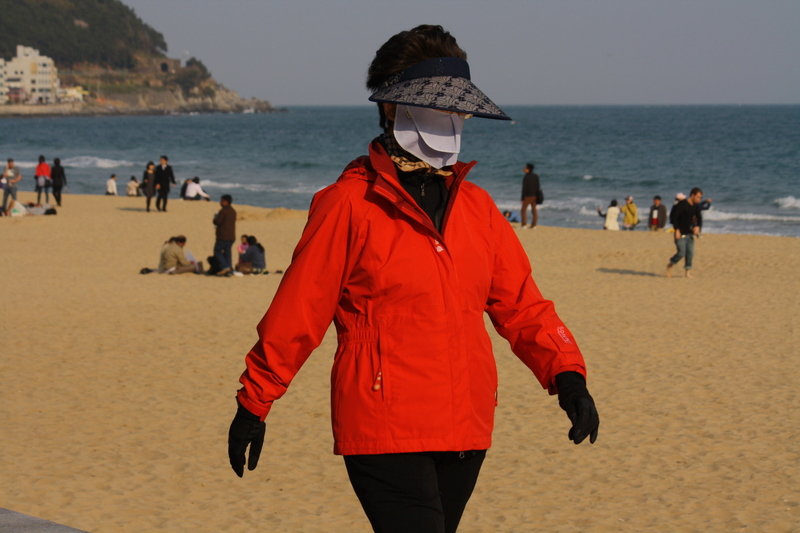 But also Koreans wear these masks whenever they are sick and don’t want their germs to spread, which is great. 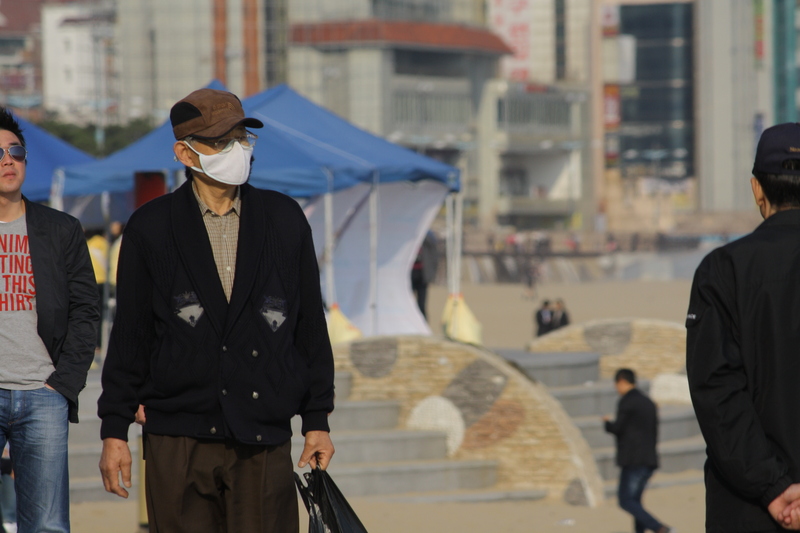 Only thing is I have seen many Koreans actually take off their mask whenever they want to cough or sneeze. And besides with the amount of spit and gob they give to the world I don’t think it makes a difference. Old people here baffle me! They are like a clan! They always stick together and they wont take any crap from you in a supermarket or bus! The funny thing is they all love wearing masks. Which is understandable because at their age the immune system is not what it was. Also they love these gigantuous hats. The sun is barely out but they’ll wear them. And then there is the brightly colored clothes. They all wear hiking jackets and it is in outrageous colors. As if they don’t want society to forget about the, It is soooo funny! And then don’t forget the perm. Its like they got fed up with having silky smooth long hair all their life so at the age of 50 the hair goes into a permanent perm! It is as if all men here smoke. As it is a big no no for woman to smoke publicly most men take it on themselves to make up for it. 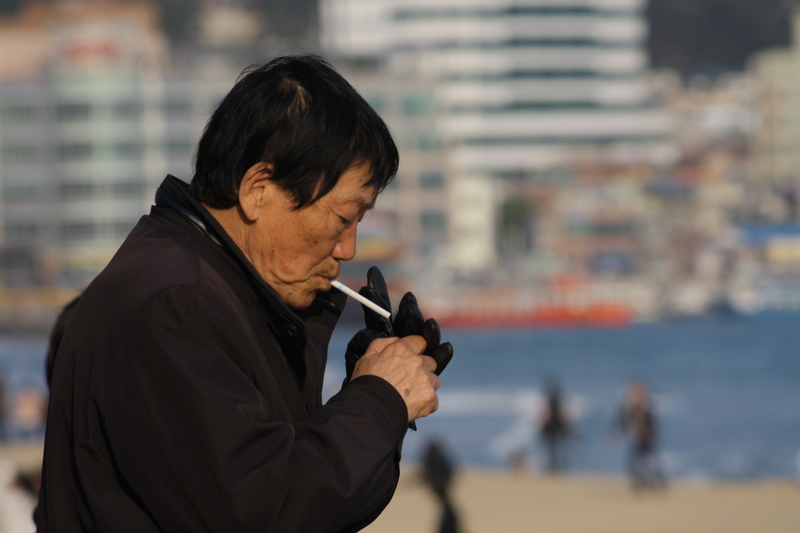 Although Korea has started to implement no-smoking guidelines the majority of the men still do smoke. Focus on the guy on the left. All young mens here strive to be a Korean Popstar. Nicola and I coined the term M & M for these men. Although it basically means “Metro Man” the origin of the term stems from Afrikaans, “Moffie Man”. “Moffie” is a derogatory term for a feminine guy and “man” means, uhm, man! Be it on the bus, the subway of just walking about town, Nicola and I alway smile when we spot these M & M’s. 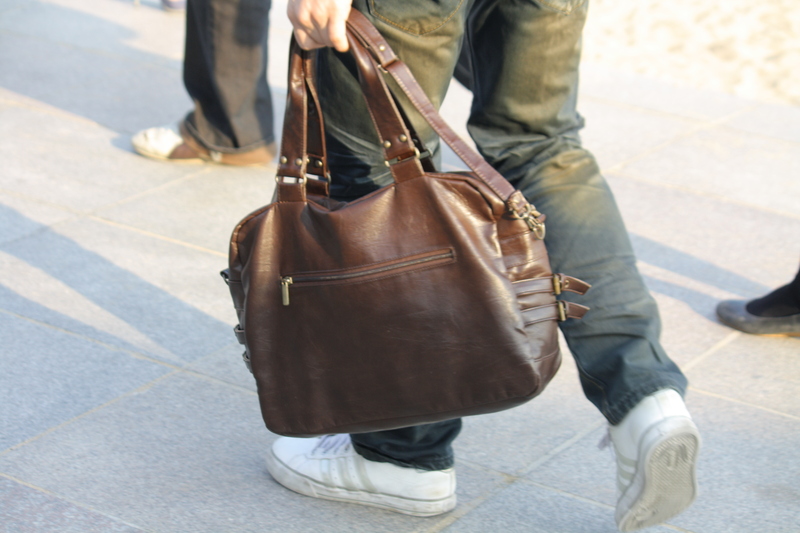 Obviously what would a M & M be without his manbag? These are mainstream here and no M & M can do without his little bag. Now it might seem a little gay, but in Korea it actually makes sense. These people have all kinds of electronic crap. Like there little electronic dictionaries, ninetendo DS’s, cellphones or rather handphones, a wallet and who knows what else. 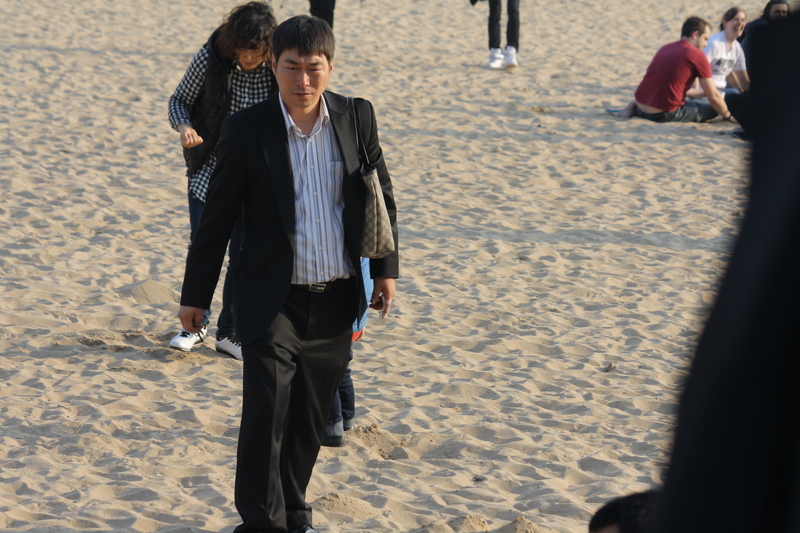 Koreans love taking pictures. They take pictures of everything and everyone. I have seen more DSLR cameras in Korea these past two months than ever before. 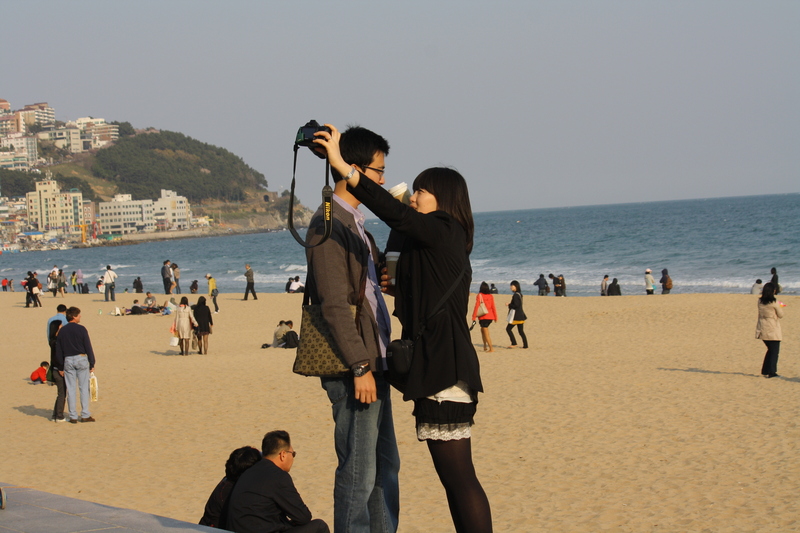 But more so Koreans love taking pictures of themselves. The couple in the pic took like 20 photos of themselves with different poses. 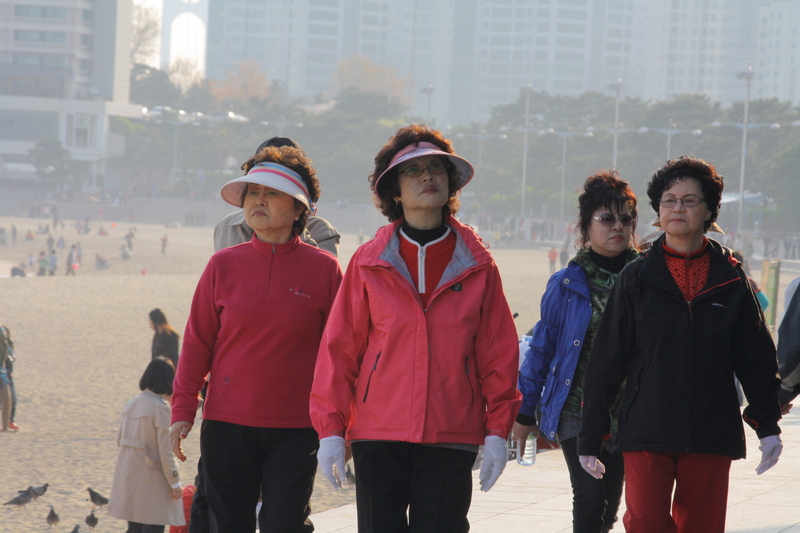 Seeing that Koreans constantly want to elongate themselves lady’s never go anywhere without their heels. Not even the beach! 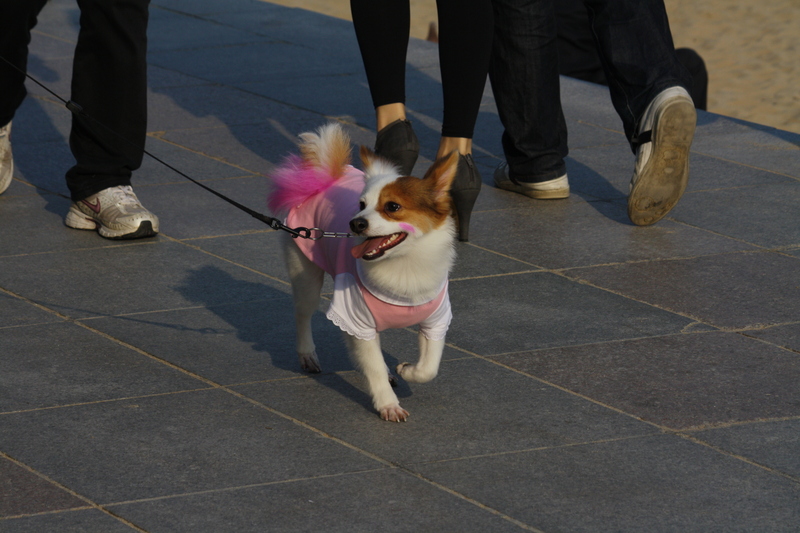 Koreans love small dogs. They dress them up and dye their fur. It’s really a lot of fun to see these dogs! Koreans are cellphone crazy. The things are attached to their hands. Korea and Japan has of the meanest cellphone cultures in the world. Even old people have cellphones. EVERYBODY has a cellphone! 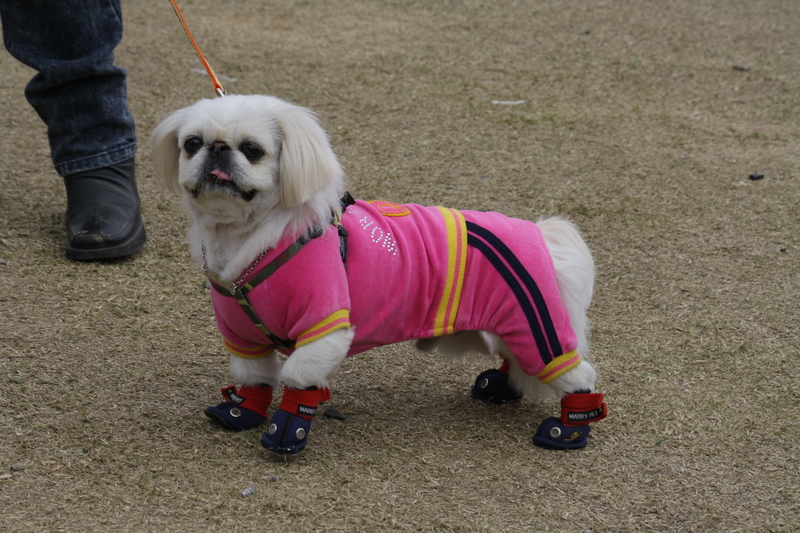 Korea is a crazy place but all these things are thoroughly entertaining! ← Box, Beach, Beer – Busan Baby!! !